Central Bank of India Has Released Latest Notifications For Various posts. All Eligible Candidates Should Apply Online Through Official Website on or Before Last Date For Given Post. Further Details Like Names, Eligibility, Age Limit, Pay Scale, Selection Procedure, Application Fee, Check Below……..
All Interested Candidates Should be a Graduate / Post Graduate degree from a UGC recognized University. All Eligible Candidates Age Limit should be Less than 65 years with sound Health.For Post Wise Qualification Details Go to Detailed Notification . Pay Scale : Rs. 25,000/- p.m.
All Eligible candidates have to submit their applications in the given format (Annexure-A). Last date for receipt of application is 15-02-2016. No applications shall be entertained beyond the stipulated date. Incomplete applications will be rejected. Further, it is informed that One Letter Box will be kept at Central Bank of India, Regional Office,Lanka, Varanasi. Last Date for Receipt of Application Is : 15-02-2016. You May open this Official Notification to get more information about Central Bank of India Recruitment 2016. Contenders may bookmark this page by using Control + D for getting latest info on Central Bank of India Recruitment 2016. 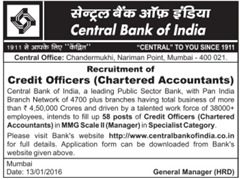 To Download Application Form For Central Bank of India Recruitment 2016.